Merged help is the process of combining outputs from multiple RoboHelp projects into a single help system. While the content is created from multiple projects, your users see a single, integrated help system. Over the next couple of weeks I will teach you how to create merged help for several output formats. Since RoboHelp's layouts work differently, I will go over each layout in turn. You have a very large project (thousands of topics). Splitting the project into smaller projects may make maintenance easier. Multiple writers work on separate parts of the documentation and you don't have source control. Without source control, only a single author can work in a project at the same time. Having multiple smaller projects makes collaboration without source control easier. You need to update parts of the help separately from other parts. If you have a single project, you create an output for the entire project. You can publish only changed files, but you can't update only a single part. With merged help, you can. You have modules that are reused in different products. With merged help you maintain a single version, and reuse that. Which Outputs can I Merge? When you merge help, you always have one master project and any number of child projects. The master project is the glue that holds everything together. When you generate your output, the master project makes sure that your help system is shown as an integrated whole. Your master project is a regular RoboHelp project. You can use any features you want in the master project. Generate a CHM file for every child project. (Using the Single Source Layouts pod, generate Microsoft HTML Help.) Then open the project that is to be the master project. Open the layout's table of contents and click New Merged Project. On the HTML Help tab, click the browse button (the yellow folder) and open the CHM file of the child project you published. 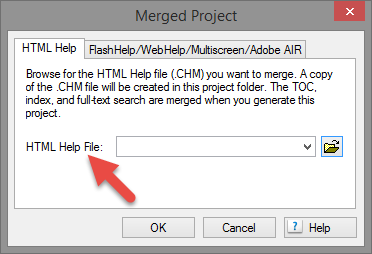 Click the OK button to merge the CHM file. The child project will appear in the Master project's TOC. Save your project and generate the layout. All that's left to do is deliver both CHM files as your help system.Whenever the child project changes, generate the CHM from the child project. Replace the CHM in the master project directory and generate your master project. 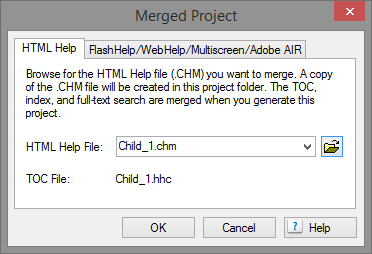 You can also replace the child project CHM in the output directly. 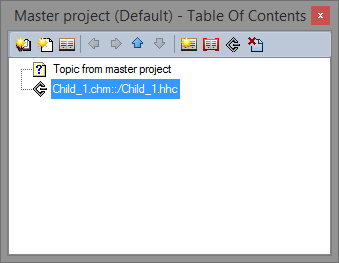 I was able to add the child project to the Master project's TOC as per your instructions, but I cannot view the contents of the child after generating the Master. What gives?